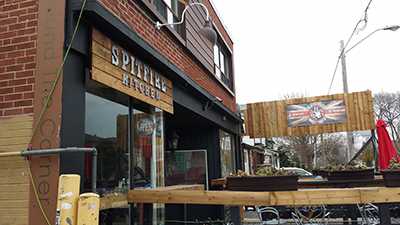 So, a few weeks ago we decided to finally get out to try Spitfire Kitchen, the restaurant opened by the owners of one of Brits in Toronto’s favourite food trucks — The Feisty Jack. It was a chilly day so the crew jumped in the motor and sped off to Etobicoke, about 15 minutes’ drive west of Toronto. We opted for the brunch menu. Spitfire Kitchen is very easy to spot from the main road, with the Union Jack in proud attendance and The Feisty Jack food truck parked right opposite. The Brits have taken over that little part of the street, for sure! It’s not a massive place, around six tables, with a few seats by the window eating area. Nice and cosy. Quick, friendly service — always a great start. Very welcoming. And diners can see everything the chef is doing at the back, so you feel part of the kitchen action. Git yer laughin’ gear around that! 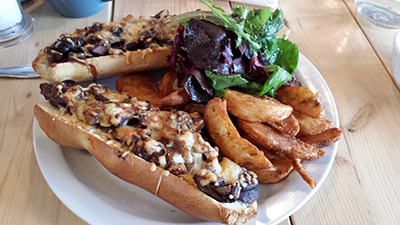 Opted for the cremini and portobello mushrooms sautéed with caramelized onion and deglazed with red wine, served open-faced on a fresh baked roll with melted Welsh Cheddar. It was DELISH. Definitely enough for two to share, a roll each, and also you can throw in a side too. One critique is that we thought it was the wrong kind of bread used for that particular topping. We would have liked it actually on toast — maybe a fried slice? — and also some black pudding on the side. We feel the menu needs a few more choices added too. But it only opened in early November so we’re willing to wait a while and go back. Once the meal was over we perused the fine selection of British goods that they also stock, and picked up a free issue of The British Canadian. Spitfire Kitchen sells frozen food to take home such as pies, mac and cheese and desserts too. This entry was posted in Uncategorized and tagged brits in toronto, spitfire kitchen, the feisty jack on December 3, 2014 by britsintoronto.